Initial jobless claims hit their highest level since November. Many more Americans filed for their first week of unemployment benefits than expected last week. The Labor Department said Thursday that 385,000 people filed for initial jobless benefits. That was up 28,000 from a week ago. Analysts were expecting the number of jobless claims to drop to 345,000, according to Briefing.com. 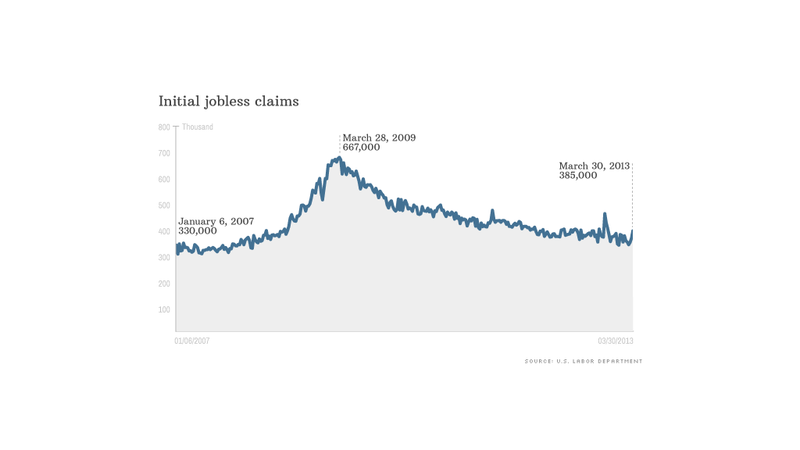 Economists, however, caution that initial jobless claims are very volatile. Only a few weeks ago, they were hovering at their lowest levels since early 2008. Meanwhile, a four-week moving average -- which smooths out the volatility -- showed a smaller increase of 11,250 to 354,250. The weak jobless claims report comes a day after payroll processing firm ADP said that private sector hiring had slowed in March, due in large part to a slowdown in construction. All eyes will be on the monthly jobs report that the Labor Department will issue on Friday. Last month, the jobs report showed that unemployment had fallen to 7.7%, the lowest level since 2008. Analysts are expecting an increase of 192,000 jobs for March, according to Briefing.com. This week's reports are leading some economists to downgrade their forecasts for Friday. Though much of the jump in unemployment claims may be due to seasonal issues, including Easter and school vacations, it could also show increased weakness in the job market, said Pierre Ellis, senior economist at Decision Economics. "The underlying trend is probably not as favorable as it has seemed," said Ellis, whose firm lowered its monthly jobs projection from 220,000 to 200,000 on Thursday. Some 3.4 million people were collecting state unemployment benefits, which last up to 26 weeks, during the week ending March 16, the most recent data available. That's down 58,000 from the prior week and down 296,000 from the prior year. Another 1.8 million were receiving federal extended benefits, down nearly a million from the prior year.